From a young age on, she has won several important music prizes, such as first prize at the Dutch Harp Competition in the Netherlands, first prize at the International Harp Competition in Brussels, a second prize at the International Harp Competition in Vienna and a third prize at both the International USA Harp Competition and the International Harp Competition in Israel. In 2006 she won a Fellowship of the Borletti Buitoni Trust from Londen. In 2009 she won the Dutch Music Prize, which is the highest distinction for a classical musician in the Netherlands. 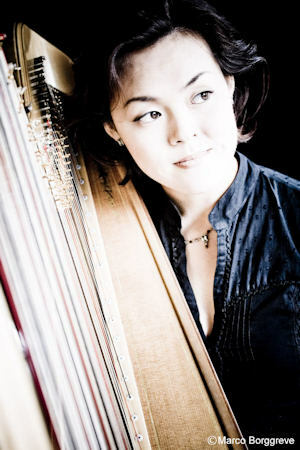 She made her debut in Carnegie Hall, New York in December 2007, where she was invited to perform a harp solo evening. 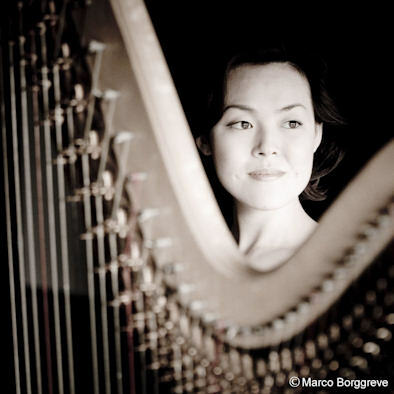 As an ambassador of the harp Lavinia Meijer has inspired several composers to write new music for her, composers such as Carlos Michans, Jacob ter Veldhuis and Garrett Byrnes. Besides performing the standard harp repertoire, she also experiments with electronic music, theatrical music and jazz. In 2008 she recorded her solo-CD “Divertissements” with record company Channel Classics (works by Salzedo, Caplet and Ibert). In 2009 she recorded with Channel Classics her next solo-CD “Visions” (works by Britten, Patterson, Byrnes, Yun and Takemitsu). She calls herself a perfectionist and a go-getter; she likes openness and honesty and is able to present herself in a good way under all circumstances. Lavinia is fully aware that the world is bigger than the Netherlands but still feels very much at home there. During the interview her infectious laughter often echoes in the room making a nice atmosphere for an interview. How and when did you make the choice to play the harp? When I turned eight I felt I was ready to choose an instrument. I immediately knew it had to be something special: no piano, violin or flute for me! I happened to know a girl who played the harp and I fell in love with this instrument! It was mysterious and I loved to grab all those strings with my fingers! We rented a so-called Celtic harp at the local music school and the first evening I played till I had blisters on my fingers. But I loved it!! A year later I started to study piano anyway with our neighbour and (because she was a much stricter teacher) I advanced much quicker on the piano. Eventually she wanted me to make a choice and I followed my heart: the harp was and will be always my instrument! I especially love the direct contact with the instrument: my fingertips are on the strings and I am embracing my instrument. The sound arises exactly from where you are! After the human voice it seems to me the most natural and direct way to communicate. From the age of thirteen you took part in many competitions. Yes, that went on non-stop. Competing with other people was something I learned at a young age: being a soloist is a pretty selfish existence you know, I always have to distinguish myself from other people! All these competitions taught me to focus and to learn certain pieces more than 100%: you need so much discipline to prepare yourself perfectly! But after a while the competitions also made me insecure: I noticed that I adapted to the jury to win. After a competition in America in 2004 I thought it was enough. I was curious what I wanted to do with my harp and which way I wanted to go. Eventually it turned out that I really wanted to go on as a soloist: to promote the harp as a solo-instrument. And this met with a lot of resistance: many people thought it was a naïve girlish kind of dream. According to these people I had to specialize. But I think my diversity is my strongest point. Classical music is actually already specialised enough. I love to hear it but not necessarily all day! Everybody has to know about the harp!! Sometimes it seems as if you want to convert the whole world to the harp!! My drive is indeed enormous: there is so much more possible on a harp than people know about! Even I was often surprised during my studies about the incredible potential of this instrument. And yes…I will do whatever is necessary to let the world know about it. When I play a concert I would love to play everything I know each time! This made me develop a kind of formula which seems to work good: I play what people expect from a harp recital but also new pieces with sounds and playing techniques which might not be associated with the harp. In this way they remember me best. During your concerts you always talk with your audience! Can you tell something more about that? I believe it gives my concerts an extra dimension: the public gets to know me in this way and I also get to know them a little bit. I also noticed that’s it’s easier for me to give my best in this way. During the concert our contact gets deeper and I like that very much! But what’s more: I really have to do some explaining! I know that people don’t expect a harp in a solo-recital! When people see and hear my personal enthusiasm they will also remember my instrument better. When I perform as a soloist with orchestra I often do miss this contact: after the concert I feel empty when I can’t talk to the audience and hear their reactions. Just playing my notes is not very satisfying for me because I really like to know the people I’m playing for!! The last few years you also studied to receive the Dutch Music Prize, the most important national music prize. Former winners were a.o. Janine Jansen, Pieter Wispelweij and Ronald Brautigam. Well, actually I had already decided to stop with competitions but one of my most important advisors encouraged me to go for this very special study/competition/prize! And after some thinking I decided to inscribe myself, to do the audition and, after admission, to participate in this long and heavy study. I wanted very consciously to convince the jury that I’m really a very special musician and not just a harpist! That’s why I also choose a very good mentor to guide me: Kees Olthuis, composer and ex-bassoonist of the Concertgebouw Orchestra. Did this multi-year study for the Dutch Music Prize give you something extra? One of the most interesting aspects of this study is to be able to meet many people outside your “normal” classical music scene. I participated for example in a huge project with dancers where I entered into a completely new world. I learned from them to be extremely conscious of my presence on the stage: that’s something very normal for a dancer but certainly not for many musicians! Of course I participated in a lot of master classes (mostly from not-harpists), I gave composition assignments after finding the right composers who inspire me and I made my debut in Carnegie Hall. and…. I learned very soon that from a business point of view everything has to be perfectly arranged too. My mother works as an accountant and that certainly helped me from a young age! You have to spend at least one or two hours a day in your own little business! Good contacts with programmers, festivals and various foundations are also of the utmost importance. There is a big network around musicians but I notice very often that all these people are not really collaborating. The more I open myself up to get to know the many different people involved in the music business, the more exciting it becomes. As a programmer or hall you can develop beautiful and exciting programs but at the end the musicians have to play them! But very often there’s a big gap between these groups. I have to admit that many musicians are also not exactly cooperating in this respect or maybe they are just too shy. And maybe the most important part of my study: I found my current record company Channel Classics. They have a very good distribution abroad and that makes a difference! They are also known of course for their excellent recordings. My choice for Channel Classics was a very conscious one! My first cd with them (“Divertissements”) got a lot of good reviews abroad and in this way opened a lot of doors for me! Can you explain why so many excellent Dutch harpists won the Dutch Music Prize? We have a very rich tradition with Rosa Spier and Phia Berghout (former harpists of the Concertgebouw Orchestra), who had some wonderful pupils. Anyway: all the harpists that won the prize were excellent musicians! But, and now I’m talking again about all instrumentalists, it’s nice to win but after that you will have to do it all by yourself again. And I’m sorry to see so many talented people give up in this stage! A musician as an entrepreneur: that will be a novelty for many people! You are “world-famous” in The Netherlands. What about your plans for the rest of the world? I am aware that I’m still in a much earlier stage of my career abroad. I do have a management in New York that arranges concerts for me in the U.S. but for my European concerts I’m still looking for one! Up till now I am arranging those by myself, but it’s getting more and more each year. I did have some contacts with big artist-managements but the first thing they tell you is: “Harp? No, thank you, it doesn’t sell and we know nothing about it.” For “mainstream” instruments (piano, violin, cello) they use so-called career-highways but for me they should build a new way and they really are not interested in doing that: it takes too much time and costs too much money!! In Asia I organize all the concerts myself but I noticed already that I use energy that I can better put into my playing! You’re really very consciously planning your career! Well, I put the bar a little higher each year. And I still find so many things I want to learn and to know. The importance of a large network for example: I think that’s really essential for a modern musician. You can be a wonderful musician but if you have no concerts to play what’s the use? And what is your ultimate goal? My goal is to make the harp better known as a solo-instrument, with all its possibilities, which are often still unknown with a wider audience, also worldwide. I was in Mexico recently and there I also learned from their reactions: they never heard a harp in this way. People embraced me! I really loved it! You were talking about the composition assignments you are giving: that’s also a way to promote the harp! Yes, happily there are very many interesting contemporary composers but most of them really have to be stimulated to write for the harp! Because if, as a composer, you never got in touch with the harp (or a harpist) it’s just not very probable that you will write something for it! First of all I have to show them all the possibilities of the harp and after that some very exciting compositions emerge! Then I’m challenged by the composer to meet him/her in his/her world! Some of these pieces are very well written for the harp but other ones are really difficult and demand a lot of work. Right now I’m working on a piece by Dutch composer Roderik de Man and I’m very happy that I’ve put through! It’s fascinating to cooperate with a composer and to make all these notes on paper come to life! Very often in history composers worked together with famous musicians of their time: that’s the way the best compositions are often written. Each composer likes to compose something that is playable so that it doesn’t end up in a closet.